Tampa Bay Times reported on June 10, 2012 a 12 years old girl died after a tonsillectomy performed on Aug 13, 2010 for chronic tonsillitis. From the details provided from the news report, it seems that several independent issues all contributed together that lead to this child's unfortunate and tragic death. This case was also complicated by subsequent non-medically related actions taken by medical personnel which will not be discussed here. It is unclear exactly when the local anesthetic bupivacaine (Marcaine) with epinephrine was injected into the tonsil region which may help with post-tonsillectomy pain control in the pediatric population. Also unclear is what concentration and how much got injected. 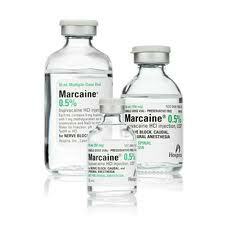 1) The risk of bupivacaine is toxicity to the heart leading to arrhythmias that may ultimately lead to a heart attack. Given report of "bloody froth" in the endotracheal tube along with acute onset of tachycardia and hypertension, I suspect the child suffered from pulmonary edema, most likely secondary to accidental intra-vascular injection of the local anesthetic (causing cardiac failure) and epinephrine (causing tachycardia and hypertension). Given these risks and fact that kids are so much smaller and more susceptible to medication risks, I personally never inject this medication during/after tonsillectomy. Even in adults, I never inject routinely, though I do offer to adults undergoing tonsillectomy (but than I use bupivacaine alone without epinephrine). The child had a congenital cerebellar vascular anomaly that ruptured leading to a life-threatening bleed in the brain. In and of itself, this anomaly would not have been a problem, but given the reported sudden hypertension, the rupture is akin to inflating a tire with too much air causing it to pop. Most likely, if the child's cardiovascular compromise never occurred, this bleed never would have happened in the first place. It's also entirely possible if the local anesthetic was never used, this death would not have happened as well. Lawsuit claims doctors' mistakes caused Palm Harbor girl to die after tonsillectomy. Tampa Bay Times 6/10/12. Comparison of clonidine, local anesthetics, and placebo for pain reduction in pediatric tonsillectomy. Arch Otolaryngol Head Neck Surg. 2011 Jun;137(6):591-7. Epub 2011 Mar 21. Preincisional bupivacaine in posttonsillectomy pain relief: a randomized prospective study. Arch Otolaryngol Head Neck Surg. 2002 Feb;128(2):145-9. Control of early postoperative pain with bupivacaine in pediatric tonsillectomy. Ear Nose Throat J. 1993 Aug;72(8):560-3.